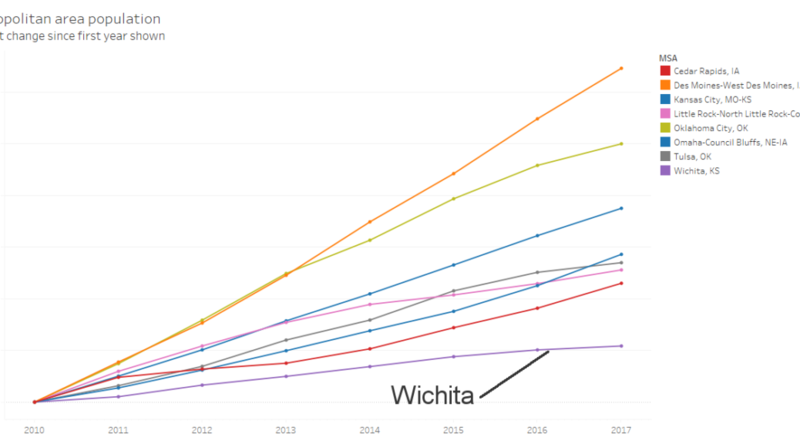 The growth of population in Wichita compared to other areas. Several Wichita city officials have noted that the population of the City of Wichita now exceeds that of Cleveland. This, to them, is a point of pride and sign of momentum in Wichita. That Wichita moved up in population rank is more due to Cleveland losing 11,006 people (2.8 percent loss) while Wichita gained 7,534 people (2.0 percent gain). Looking only at city population, however, misses the fact that the Cleveland metropolitan statistical area population is 2,058,844 compared to the Wichita MSA at 645,628, a difference of 3.2 times. Wichita officials usually recognize this and have started to emphasize the importance of the region (the MSA), not just the city. Many of our civic agencies have named or renamed themselves like these examples: Greater Wichita Partnership, Wichita Regional Chamber of Commerce, Blueprint for Regional Economic Growth, Metropolitan Area Planning Commission, Wichita Area Planning Organization, Regional Economic Area Partnership of South Central Kansas, South Central Kansas Economic Development District. Further, there is more economic data available at the MSA level (compared to the city level) from agencies like Bureau of Labor Statistics and Bureau of Economic Analysis. This data includes important measures like employment, labor force, unemployment rate, gross domestic product, and personal income. City boundaries are still important, as Wichita, for example, can’t impose property or sales taxes outside the city limits. Nor can it write laws affecting neighboring towns or the county. But not even schools respect city boundaries, with several large suburban school districts (Andover, Maize, Goddard) reaching far into the city limits of Wichita. While Wichita may be the 50th largest city, its rank is not as high when considering metropolitan areas. Worse, its rank is slipping as other areas grow at a faster clip. In the 1990 and 2000 census, Wichita was the 80th largest metro area. By 2010 Wichita’s rank had fallen to 82, and for 2017 the rank is 89. Wichita officials incessantly talk about momentum. Using a misguided measure of regional size and growth (Wichita is larger than Cleveland!) is one example. It is terribly unfortunate that the Wichita economy is not growing. What’s worse is the attitude of our city leaders. If we don’t confront our problems, we probably won’t be able to solve them. In an interactive visualization I’ve prepared from census data, you can compare growth in metropolitan statistical areas. Click here to access the visualization. 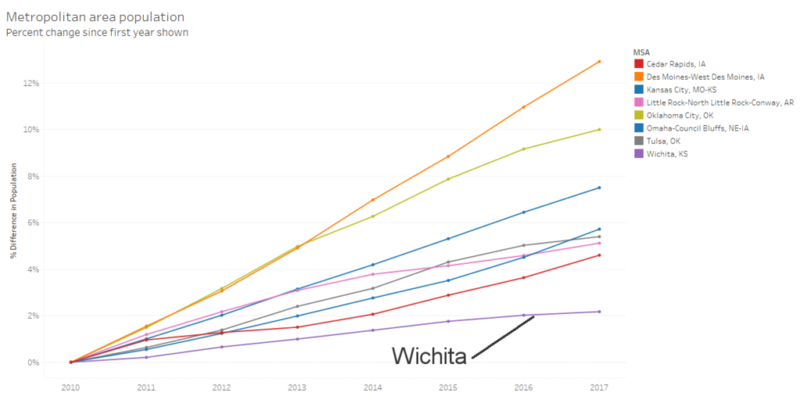 Wichita and other population growth. Click for larger. Great article Bob. As usual, you have explained the problem very accurately and very simple. The big question, how do we grow Wichita, the only answer our politicians have is to spend money or give away incentives. All these incentives such as Star Bond projects are just cannibalizing revenue from existing businesses. It is not growing the pie. We are growing at 1/3rd of 1% and our politicians think they are doing a good job. Not one of them is even talking about how we can do better. If we hit a recession we will lose population.